VIXX (빅스 pronounced "viks"; acronym for Voice, Visual, Value in Excelsis) is a six-member South Korean boy band, signed under Jellyfish Entertainment. All members participated in Mnet's survival reality show MyDOL and were chosen via an elimination system through viewer votes. 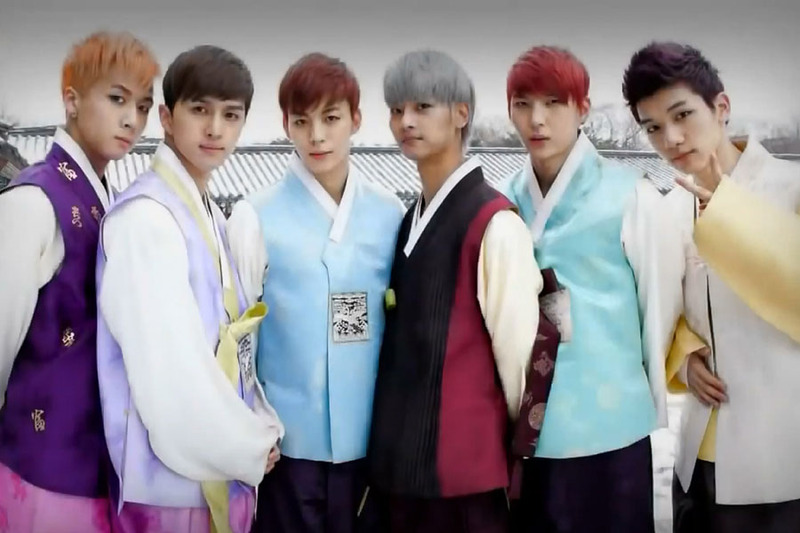 The name, VIXX, was also chosen by viewer votes. They also can sing IMHO more serious songs like Thank You for Being Born and I Don't Want To Be An Idol. I'm not a Starlight (as their fans are called), but yes, I like their singing voices and even the rapping voice and how they mix together, but I think I've got a weak spot for Leo's singing voice. He and Ken sing the solo parts in I Don't Want to be An Idol. Leo also sings a duet with Lyn in Blossom Tears. On Youtube you can also find clips of Leo performing on stage in the musical Full House (april - june 2014), even while those clips are not the best, it gave me a good impression as of how his voice would sound in a live performance. As said, I'm not a Starlight (at least ... not yet), so I don't press F5 continuously to see whether there is some news about VIXX. However, every few months (sometimes a bit longer when I'm busy, like in the past few months) I check whether there are some new developments. And that a sub-unit of VIXX had debuted in august, VIXX LR. That's where I went: Hey, a subunit called VIXX LR? Who's in it? Leo and Ravi??? At first I thought it was a strange combination, the quiet singer Leo with the outspoken rapper Ravi. There's the saying that opposites attract, but Beautiful Liar is IMHO an example in extremis. For me, the synergy of L & R went off the scale. It's also one of the few instances that I've heard Ravi sing, even if it's just a few lines. But his bronze baritone mixes very well with Leo's high and silvery tenor. The MV has layers and layers of meaning and symbolism. Whoever thought out that visual imagery... well, (s)he has my respect. Because in my opinion the imagery represents the lyrics extremely well. Combined with the poignant singing voice of Leo, the intense rapping of Ravi and the intensity of the acting of and between Leo and Ravi, it could deliver it's message to me, even while I do not understand Korean. Online you can find whole amounts of analysis of the music video in combination with the lyrics of the song, so I won't go into that again. I'll just say that this song was able to bring adult men (male persons) to tears. Including me. After having heard Leo sing in Beautiful Liar I sincerly thought: "If it's possible to fall in love with a singing voice, then I'm really busy with falling...."
I'm fervently hoping that VIXX LR will produce some more songs. They've set the bar quite high for their future productions though. BTW, if you see any mistakes that I've made, concerning, VIXX, VIXX LR or the members, feel free to correct me. Last edited by Thierry23 on Jul 19th, '16, 09:35, edited 2 times in total. Some 8 months since I wrote the previous post here. In the meantime a lot has happened. Chained Up with its very catchy chorus has replaced Eternity as my favorite song from VIXX. During the Live performance in the SBS Gayo Daejun on 27th december 2015 Ravi took off his jacket. The song Hot Enough in several live performances were times where Hyuk can steal the show. From the cute maknae he's really grown up and now shows his masculine noona-killer side . Dynamite is the lead song of the single album Zelos. The song is catchy, but in my opinion softer than Chained Up. In the musicvideo it's in my opinion Ken and Hongbin who are the showstealers. I haven't seen them like that before. As far as I could figure out, it's jealousy that's the concept. This song was released in Japan, june 2016. When I first heard the ballady song, it felt as a song where you say goodbye to somebody, and later the lyrics proved me right. Even when not fully understanding the words in Japanese, I felt very moved by the song. If you can find the music video, you can see that the concept is really shown in what happens. It's also where Ravi is (IMHO) the showstealer in the few scenes he has. It's quite strange for me, but I have to say that he looked quite handsome there. I've come across several fancam's of their fanmeet VIXXCHOOL of that date. Let's just say, that I was nicely surprised by the singing(!) of Ravi (the rapper) and the rapping(!) of Leo (main vocalist)! I wasn't aware of it, but when VIXX was in China (Taiwan? not sure) they also appeared in the tv show Heroes of Remix with Monsta X, iKon and several others. They performed covers / remixes of songs, under guidance of a mentor/producer, collaborating with choreographers and DJ's. When I came across their performance of Xi Shua Shua (嘻唰唰) I was ... stunned, excited. (heart rate rose from 60/70 to around 140 ) The link provided, gives you just an impression of how it must have been. The video quality is not very good, and there are cuts to audience, producers, DJ's other celebreties, etc., because AFAIK it's how directors do TV-shows in China. A version with English subs is available. There's also a fancam of the performance, which shows the dance in more detail. And their last performance of that show blew me away again. Why? It's not often that I see handsome adult men dancing with hand fans A fancam shows the dance in more detail, althought the sound quality is ... not very good. Hakyeon / N is really shining in this performance. I'm not completely sure, but I think those fancams show that VIXX is really singing during their performance, not just lipsyncing. After having watched the performances in Heroes of Remix and their Fanmeet (and other videos of live performance), I must say that I'm starting to feel a littlebit envious of those who were lucky enough to see a live performance of VIXX. I still haven't been able to attend a live performance.